Previous DVDs of the glamour model/bikini model genre have used cheap background music. 19BOX RECORDINGS set out to change that and has been working in cooperation with the new DVD label, DIFFER. Latest installment "SUPE004" featured AIRI NAGASAKU. This unique and innovative partnership allows you to hear 19BOX RECORDINGS’ tracks before their actual release date. Due for release on 26th December 2008. New 19BOX CD, "19BOX INTO THE BATTLE IN RUSSIA" mixed by DJ 19 & Serge Que, in stores now!!!" Three months after their lip-smacking "Al", DJ 19 & STEVE MAY return with a vengeance under their DJ 19 4 STEVE MAY guise yet again. 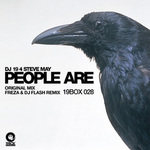 Using their experiences of late night over indulgence to influence their music, "PEOPLE ARE" merges the two continents of Oceania (STEVE MAY's Australia) and Asia (DJ 19's Japan) into one small, yet powerful capsule of music. "PEOPLE ARE" takes on rock elements and amalgamates it with a simple, yet very effective synth line and throbbing bassline. Together, these elements create a tune under pressure. Be careful, because this one's about to blow! The b-side sees top Russian production duo, FREZA (ANATOLY BETSKOV) & DJ FLASH (SERGEY MAKSIMENKO) on remix duties. Their take on "PEOPLE ARE" is a more trance-based affair. FREZA & DJ FLASH has made numerous progressive house and breaks tracks for labels such as BAROQUE, PLASTIC FANTASTIC, SOG CHROME, DORIGEN MUSIC, PROTON MUSIC and SYNERGY. They've also remixed people like DEPECHE MODE, BUICK PROJECT and STEVE MAY. Due for release on 25th DEcember 2008 exclusively at beatport. Three months after their lip-smacking "Al", DJ 19 & STEVE MAY return with a vengeance under their DJ 19 4 STEVE MAY guise yet again. Using their experiences of late night over indulgence to influence their music, "PEOPLE ARE" takes on rock elements and amalgamates it with a simple, yet very effective synth line and throbbing bassline. Together, these elements create a tune under pressure. Be careful, because this one's about to blow! The b-side sees top Russian production duo, FREZA & DJ FLASH on remix duties. Their take on "PEOPLE ARE" is a more trance-based affair. Due for release on 25th DEcember 2008 exclusively at beatport.